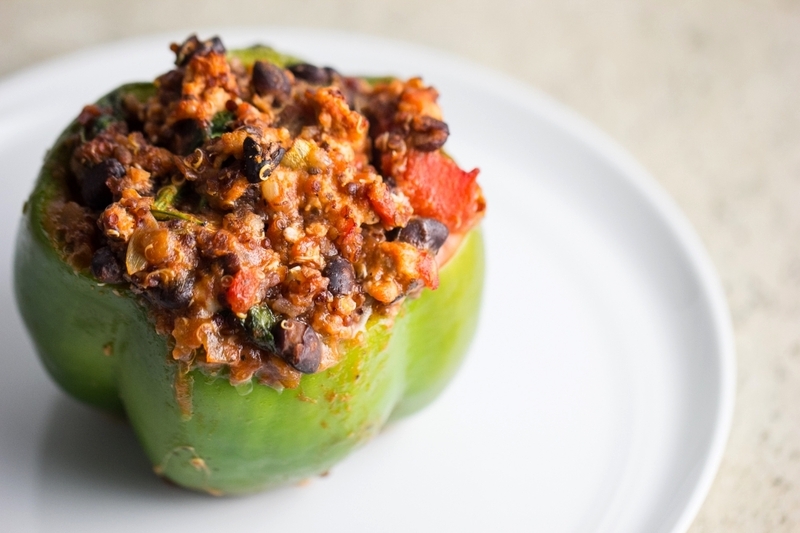 Stuffed peppers are a great platform for all your favorite savory treats. It's a fact. I could easily eat stuffed peppers once a week, Conor doesn't agree. So I'm forever trying to make exciting stuffed peppers hoping he'll enjoy them as much as I do. These were a great success! Filled with salsa, quinoa (keen-wahh), turkey, spinach AND black beans. SO MANY TREATS. Mama Rubes and my grandmother make the best ones, filled with sauce and rice, but this version is great because it's pretty light and healthy. Also the second best part about making stuffed peppers is having stuffed peppers for leftovers. You are welcome. Start by heating a large saute pan to medium heat and add olive oil, shallot and garlic, letting them soften and slightly caramelized- about 5 to 7 minutes. Add the ground turkey, using a spoon to break it up into bite size pieces. Let cook till the meat is evenly browned. Turn heat to low and add salsa, tomato sauce, crushed red pepper and about a 1/4 cup of water. I like to add the water so it's not too stiff when you bake them, I think it helps keep the pepper juicy while you bake it later on in life. I'm getting ahead of myself. ANYWAY, Now stir that all together. Add the black beans, bay-bay spinach, quinoa and 1/2 cup or 3/4 cup of cheese...I naturally have a heavy cheese hand..can't help it, stir together. Turn off the heat! In a small casserole pan have your peppers sit up straight and snug all next to eachother. I like cooking them this way the best, you have to sometimes to a little-jig-saw-puzzle-like action to have them all kind of lean and work together. I think it's worth it because then you have a full dinner contained in one peper. I also think I like stuffed peppers this way because this is how my grandmother makes them, she also adds a slice of American cheese at the bottom of each pepper so you get truly wonderful cheese party at the bottom of your pepper. So just an idea..you should really consider it.